In a small autonomous power system, the electric power is usually produced by means of an electric machine operated as a generator. The often used one is an induction generator. The generator supplies the DC-link through the controlled converter (voltage source inverter – VSI). The appliances connected to the same DC-link consume power and therefore the DC-link capacitor is discharged. To maintain the decreasing DC-link voltage level, the same power amount must be delivered by the generator. In case of the induction generator, its control is specific as no external source for machine excitation is present. To obtain the torque value desired by the DC link voltage PID controller, the generator is usually controlled by the field-oriented control (FOC) method or direct torque control (DTC) method. However, the model predictive control (MPC) method has been utilized for electric machine control in recent time. 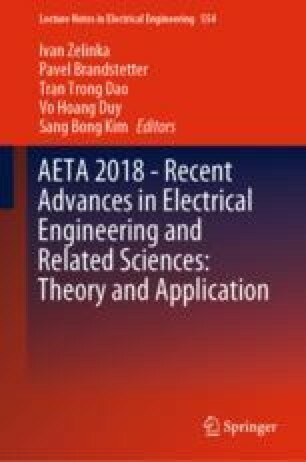 The paper explores the possibility of employing the predictive torque control (PTC), which is often used implementation of MPC in this type of applications. The PTC method ability to control the DC-link voltage in a small autonomous power system has been verified experimentally on a laboratory system with induction generator. This material is based on the work supported by the Technology Agency of the Czech Republic under the grant for Competence Centers Program, project No. TE02000103, and on the work supported by the Student Grant Agency of the Czech Technical University in Prague under grant No. SGS18/132/OHK3/2T/13.